Candy, 7 Year Old Calico who Lost her Elderly Mom to Assisted Living now needs your help. UPDATE: You may remember this story - 3 kitties losing their home when mom is moved into a nursing facility. 2 kitties have been adopted, but Candy became sick. 10 days later Candy is still there and now has a definite diagnosis of ***Kidney Disease (See Info below)... She is doing very well now... EATING & playing and a VERY nice kitty. Even I did it for 3 years and it gave our cat an incredible quality of life that she would never have had. I had never put a needle into anything...the needle does NOT go below the skin so it is NOT difficult or painful what so ever!!! I developed a routine and our kitty went right along with it...The vet states that Candy takes the fluids quite easily...that is a blessing! 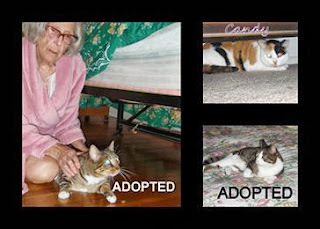 Candy's 2 house mates have been adopted into WONDERFUL HOMES...Skippy and DAISY. ORIGINAL POST 10/7: Mom is going to Nursing Facility Wed... her 2 senior kitties will be euthanized Wed morning unless rescued! DAISY, tabby, with her mom (on Left), CANDY, calico (top right) and the lover boy, polydactyl, SKIPPY (lower right) HAVE NO WHERE to GO. They will be euthanized on WEDNESDAY AM unless we can find RESCUE, ADOPTER or FOSTER HOMES! They do NOT have to stay together. Transport available. Their mom is ELDERLY and going to nursing facility on OCT 9th!!! She had 5 cats. She can take 1 to the home. She found a home for one but these 3, including this sweet girl LITERALLY have NO WHERE to go! Shelters and rescues are full, they have ONLY offered to euthanize the three seniors! ALL are INDOOR ONLY, SPAYED/NEUTERED and used to being handled. They are all reportedly healthy but haven't been to the vet for some time. They are nervous right now b/c their home is being packed away and their lives are upside down…this is their ONLY last chance. Her house is SOLD and she needs to be out by the end of OCT 9th, she has pneumonia, she took them in as kittens, they kept her company while she cared for husband with dementia, and now she can't take more than one to assisted living. These are the 3 who need placement by Tuesday Oct 8!!!!!!!!! DAISY is 10 years old, grey with stripes, female, spayed, lovable, indoor only, likes to be petted and likes belly rubs. 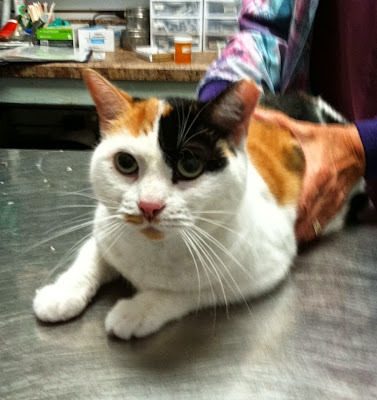 CANDY is 7 years old, calico, spayed, well-mannered and lovable, indoor only, doesn't like to be picked up but still enjoys belly rubs and being petted. SKIPPY is neutered and 10 years old, indoor only. Well-mannered and lovable. He sleeps on the bed with her, he is affectionate and loves belly rubs and head butts.